Home>Discussions>DOORS & WINDOWS>Concrete step as threshold on exterior door? Concrete step as threshold on exterior door? I am in the process of replacing the front door on my house, and I've run into an interesting issue. The front door opens to a covered concrete porch with a single concrete step that comes up to the same level as the finished floor on the interior of the house (see picture links below). I plan to remove everything down to the rough opening, and install a new pre-hung unit with door and sidelights as a single piece. After removing the threshold and interior trim it dawns on me that there is no wooden sill at the bottom of this door opening. The sides of the door frame seem to be embedded directly into the concrete step. I'm going to have a problem with the new prehung door I'm going to be purchasing since it will have a full frame. I don't really want to sit the new door frame on top of the concrete step because that would make the door much higher than the interior floor, and also the step is angled downward toward the outside so it won't make a level platform. Is my best option to bust out this step with a jackhammer and build it back up with wood? Any advice on how to do that? 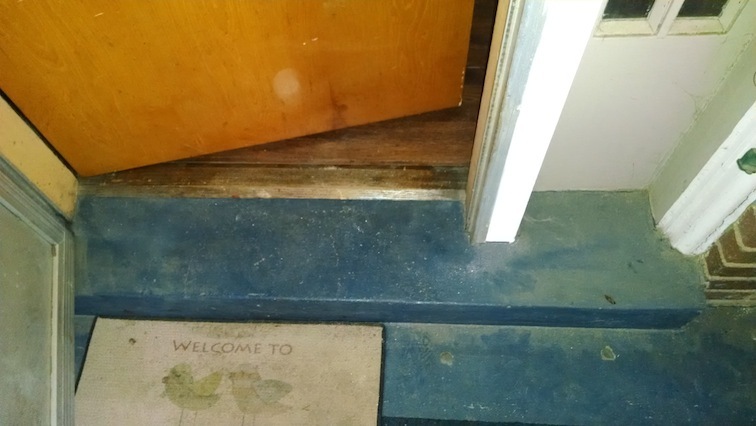 Re: Concrete step as threshold on exterior door? I'm betting the step was an afterthought added once they discovered the door was too much higher than the walkway, so with equal amounts if intelligence they made it level with the floor. New pre-hung units do have a raised threshold but it's not excessively high and most folks do fine with them. They are not all equal- different manufacturers use different styles with somewhat varying heights- see what's available to you first. I think your main problem may end up being the rough opening height (and maybe width too)- check it out carefully. Just as with thresholds, there's a little variation with those dimensions from different manufacturers too. I work on a lot of old houses and sometimes doors and window framing is not compatible with today's pre-hung units because there were no standards back then, so I've learned to check everything before purchasing anything, then measuring what I plan to buy to confirm that it will work before taking the old unit out. Pull your interior trim to measure; nothing lost because you'd be doing that anyway, and at least you're not putting the old door back in because the new one didn't fit! I have ran into the same problem and was wondering what you did for yours. My door frame is in the concrete threshold about 3/4" . I'm not sure if I should bust out the concrete, or take out the new threshold and try to fit it in the existing holes the poured around the jams. Any help would be greatly appreciated.